Mentor Legion #6 – Tactical Squad III-2 | Azazel's Bitz Box. 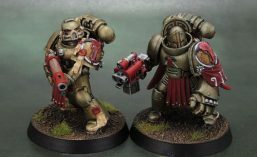 Here’s the next pair of models that go with Tactical Squad III. The Sergeant and the Corporal. The sergeant is the metal model that originally came with (from memory) either a boxed tactical or Devastator squad in early 3rd edition. I’m thinking it was probably a Dev squad since they came with metal arms and backpacks for their heavy weapons, so a metal model for the Sergeant makes more sense, while a Tactical Squad of the time could very easily be all-plastic. 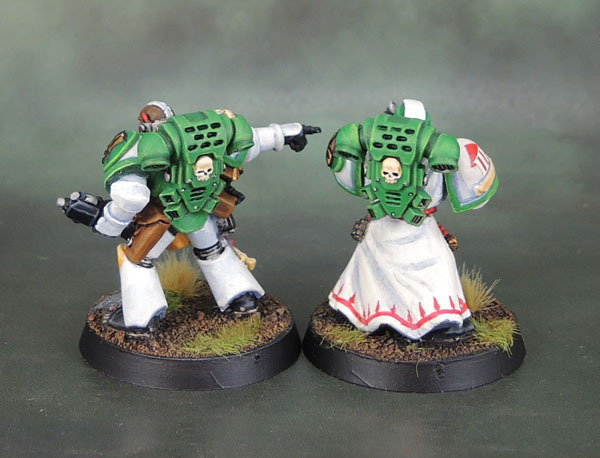 His offsider here is one of the “robed marines” which were the first incarnation of the Robed models pushed out for Dark Angels – again in 3rd edition, based on the plastics of the time with sculpted details simply added on top before casting in metal. I originally envisioned this guy as the Sergeant for Tactical Squad I, which at the time would have been the veterans. They had a slightly higher statline, but not much else – they certainly didn’t have the gear of modern Vanguard or Sternguard. 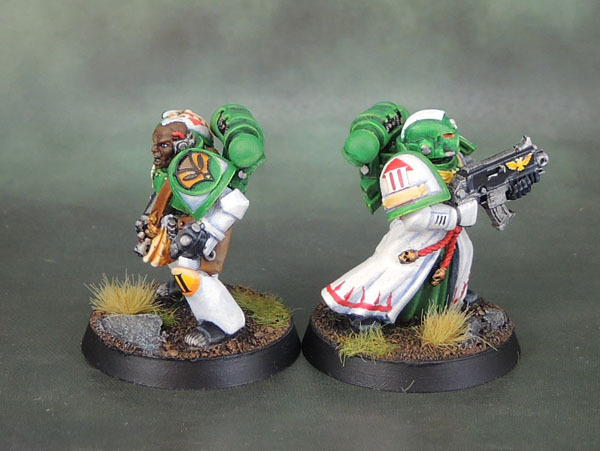 Obviously this guy doesn’t fit into either of these categories, so I changed his squad designation marking from I to III, repainted his helm from white to green, and now he’ll work fine as a 2ic for the standard tactical squad. On some of the older models with metal shoulders, the 3d-printed icons can be a little big. Still works well, though but it does illustrate the variation, shrinkage and warpage that you get with metal models at times. Nice. I thought you did a good job with the skin on the marine, who is pointing, and I like how you are jazzing up the hemlines of your various subjects these days with decorative patterns. That lends some interest to a robe or cloak that otherwise might be kind of bland. The funny thing is that I did the hem pattern on that robe back when I started it, so in the 3rd edition days. I thought that darker colours work well, but not the bone and lighter colours that – yes – look very bland. The pointing guy actually came as part of a pretty nifty metal command squad that also contained a Techmarine, standard bearer, Apothecary and Captain, if memory serves. Ah yes, now I remember that box! I’ve probably still got the physical box in storage as well somewhere. I could honestly only use the original badge for my version of these guys. Unlike the Space Shark/Carcharodons, the original still stands up well, and is a much more unique and appealing icon than a simple red raptor head in profile. 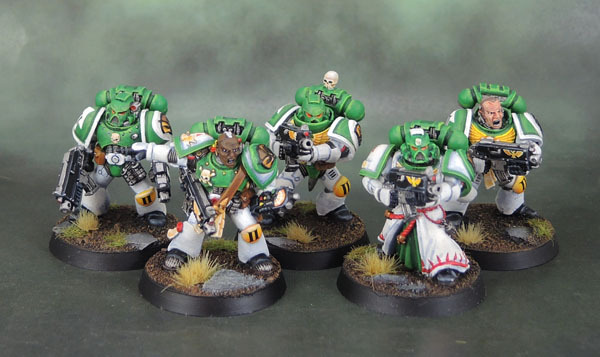 As for the dark-skinned sergeant – as with the hem pattern – original paint choices from the late ’90’s. There were some great Models in that Command Squad. I still have the Sarge and Standard bearer, tho they’ve been converted to a Long Fang Ancient and Grey Hunter Standard respectively. 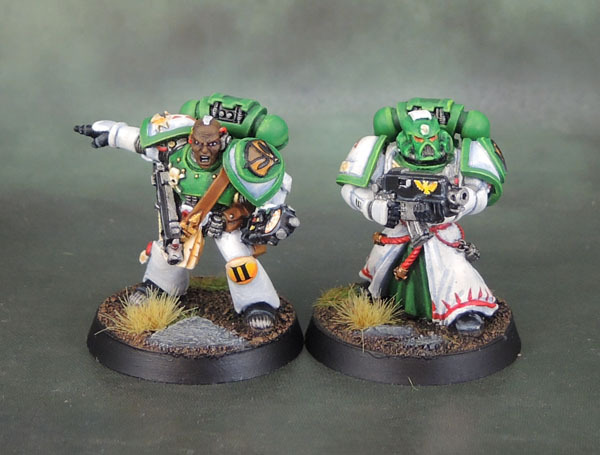 I know I sold off the Techmarine, and I think the Apothecary too, but I’ve actually got two of the captain lying around. I should fix those up again, now that Storm Bolter/Power Sword is actually a decent setup for a backfield Captain. Yep, I can picture the others from that command squad. I know where they all are, even. In the storage containers to the right of me, unpainted! Very nice. There is definitely a Buzz Lightyear feel about the seargent which I like. Heh, thanks. I’ll have to be sure I keep purple accents right away from this army! Thanks Alex. Yeah, I think throwing in a Robe or Tabard or something does help with giving units variety. All the marks of armour now easily available in plastic help to do the same. All much easier these days! These all look good! 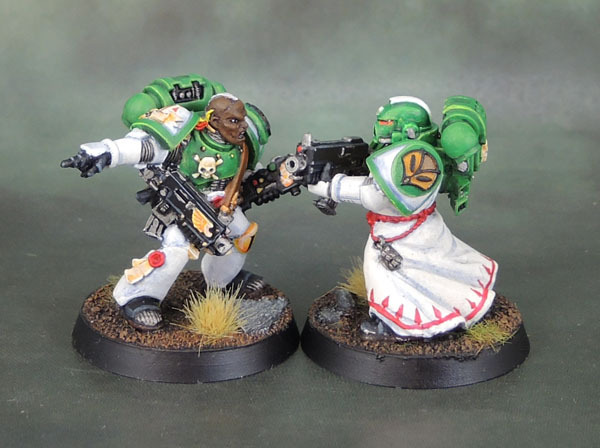 I really like the pattern on those robes, they are impressive and I must confess, I have never been able to pull that effect off on my own models. Well done! Thank you – it was easier than I thought it would be. Just drawing a line around the hem, then just thin lines at even intervals, then turning those lines into small sort-of-arrow shapes. The freehand on the robe really turned out well and sets it apart. I also appreciate the ethnic diversity and thus inclusiveness of your miniatures. Both colour schemes work very well with each surface or section being nicely delineated . Love seeing this force coming together. Can’t wait for a big army shot.